Excellent tour with very knowledgeable guide. We thoroughly enjoyed our day and have recommended our guide to two separate groups of friends who will be visiting Scotland this summer. Amazing tour, Ally is funny, full of information on the land and its history. We saw distilleries off the beaten path, Glenfarclas was amazing! Amazing tour, Ally is funny, full of information on the land and its history. 3rd tour with Ally, Isle of Skye. He met us at the hotel Sligachan, and drove all over the island, where Ally was born & had spent time with grandparents on their farm. Loved Neist Point, westernmost tip of Skye with the Kilt Rock waterfall overlook. The drive to the little town of Portree, with its painted houses, was lovely. On the way, at Uig, old follies (small stone lookout forts) were visible, somewhat ruined but still standing strong. Hated to part with Ally—he knows how to welcome visitors. 2nd of 3 tours, Ally drove us to Clava Cairns (2000+ yr old burial mounds) near Inverness, the stunning Culloden Viaduct & Culloden battlefield & visitor centre, Loch Ness, Urquhart Castle, & even close up to a famed "heeland cuhe" (Highland cow). His commentary was informative, always expanding on what was provided in the venues themselves. Most pleasant way to visit: peaceful & tailored to our interests. Ally had been a stone mason earlier & added info that helped. Best possible choice of guides! Ally descends from the healers of Skye, and wears the kilt of the tartan MacBeth (Blue Stewart?) on his tours. Proud and knowledgeable about his heritage, he drove us on 3 separate tours, this being the first, with visits to Rosslyn Chapel, Dean Village in old Edinburgh (we requested in place of Edinburgh Castle, as we were visiting on our own), the Royal Yacht Britannia. On time, quick witted & quick with humor, he charmed us and opened our eyes to the history of the area. Loved Ally & the tour! Ally is a great guide. We had a wonderful day exploring the area around Inverness. Ally was totally flexible and accommodating as well as great fun. Ally took us on backroads to see beautiful scenery away from the typical tourist spots. His recommendations for a lunch spot and local shopping were spot on. The vehicle was very comfortable and well maintained. Best of all is Ally's personality and style. We all had a great time. We laughed a lot, got great photos, and saw a lot of beautiful sites. Ally was great, picked us up on time and in tradional kilt. He was very knowledgeable in the history and lore of the area that we toured. Laid back and relaxed was the feeling we had while touring with Ally, saw parts of the back roads and landscape that was breathtakingly beautiful. Ally has a dry wit that most would find amusing and added to our adventure in a most delightful way. We recommend Ally with confidence that you will have a good time. on time and very informed of the area.. would use again. Ally was very informative, engaging and flexible. We ranged in age from 12 to 68 and he was great with all of us. If we were doing another tour in Scotland we would definitely use Ally again. Ally got us to Edinburgh Castle before the crowds got too large. We enjoyed our tour and then he guided us to a great place for lunch. We had to battle the rain but he took us out to Roslyn Chapel and then back to town for more pictures of the Royal Mile. He is a wonderful guide and has great knowledge of Edinburgh and Scotland. Alexander (Ally) is an exceptionally knowledgeable and entertaining guide (a rare combination) that we would recommend without reservation. Simply great! Ally was super! He went above and beyond to ensure that our group of 20 teenage girls and three adult chaperones received the best tour possible. He was able to pair us up with a truly wonderful bus company as well as a fantastic driver. (Kevin) I honestly believe the girls would not have enjoyed Scotland as much had it not been for the Ally and Kevin team! Ally shared the rich history, traditions and Highland way of life with us allowing all to fall in love with Scotland. May we return soon! Ally was great guide who takes his job seriously. Never late and explained the history of Scotland in entertaining and informative manner. If you are interested in politics he will be happy to explain and discuss. (Opinion isboth mine and my wife and he rarely agree on most things). One last opinion ; Ally has great sense of humor. What can I say about Alexander? The short version is he was fantastic! What a character! He was fun, knowledgeable yet extremely calm and professional. His enthusiasm and energy seemed boundless and we loved it! I am an over-planner by nature and he took all my questions in stride. I simply cannot recommend him higher. Our entire group including teenagers and grandparents loved him. Consider yourself in GREAT hands with Alexander as your guide! This was our second day with Ally and it was outstanding. He was great fun to be with. I hope we will have another chance to explore the area with him one day. We had two days of tours with Ally and really enjoyed being with him. He is very friendly (and funny) and has a great knowledge of the area. Highly recommend him. Our tour with Ally was the highlight of our time on Skye. Besides seeing areas of geologic interest, historic sites, castles and awe-inspiring scenery, our conversations were interesting and enlightening on a wide variety of topics. He also gave my husband tips on driving on the narrow roads of Skye and showed us the road to the restaurant where we were having lunch the next day! Alexander (Ally), is an amazing guide. He customized a tour for our family that included top Outlander sights (we are huge fans - Lallybroch - imagine! ), Sterling Castle, beautiful parks and small towns and delivered us to our hotel in Belfast. Ally is highly knowledgeable and agile based on the needs of the family. It was a great tour and these Texans highly recommend Ally! We really enjoyed our day with Ally. One of the best things was that because he was born and raised in the area, his stories were so personal and will be remembered for years. I.e., he would say "this is where my cousins and I would ...", or "this is my grandfather's house where we ..." The weather was spectacular which made it even better! Thanx Ally. This is a great guide. We had a misty overcast day, but Ally took us to locations that seemed to minimize the dreary day. He has a unique sense of humor and a lot of information to share. We learned a lot and saw a lot. I would highly recommend him for customized tours of Inverness and Edinburgh. Back with Alex for day 2. Alex was part of the family by now. We had another great day! Lots of fun and experienced great adventures. We all are haggis together as a family too! Highly recommend using Alex! He will do anything you ask and take you wherever you want to go and see whatever you want to see. We were on a ship and had time constraints and Alex worked with us to fit in everything he could. Our guide met us in his traditional kilt and loaded us up into his van. There was plenty of room and plenty of fun! Alex was great! He put up with all our silliness and jokes. He took us everywhere we wanted . What a great day we had! We had a most amazing tour of the Isle of Skye with Ally B. He is very knowledgeable about local history as well as Scottish history in general along with flora, fauna and whatever there is to discuss. He has a wonderful sense of humor and was a pure delight to be with. The weather wasn't very good, but we still had an amazing time. I've never enjoyed a locally guided tour so much in my life. I will remember Ally and this tour for the rest of my days. Be sure to book any tour in Scotland with Ally. Ally was a great guide. He grew up in the area we toured and it showed. At no time did we feel rushed. He gave us tips at different stops to get the best views. He also knew the best locations to take pictures. The falconry display at Dunrobin castle was spectacular. We also loved the stories he shared about wearing his kilt. Very personable and a great tour guide. Thanks Kilty! This was the second day we spent with Ally and although the first day was perfect, this one was even better. Loved the tour, sights but most of all Ally's professionalism, insights and overall good humor. This is a great day tour from Edinburgh and only made me wish I had more time to venture further north into the Highlands! Highly recommended! I really could end this review after one word, terrific but thought that details might be appropriate. Ally was a perfect choice for my family. He was prompt in picking us up, his vehicle was immaculate and comfortable, he knows his way around and his driving skills are excellent. He serves up just the right amount of information without being overwhelming and has a lovely sense of humor. The trip up to St. Andrews was unhurried and lovely. Overall, a great day. Staying on the shore of Loch Ness and having only 1 day to explore Skye I needed the most comprehensive tour for this magic isle. I am glad for having chosen Ally for this job. The 12 hours marathon was wonderful and not nearly tiresome. Ally is a truly local guy who seems to know just everything about these fantastic places. Ally was more than amazing. He went over and above my expectations. He has a wealth of information and really knows everything about Scotland. He was also fun and energetic. He has great story's. He let us off to take pictures along the way and always new a great spot to stop. We got to go off our rout to see special places witch was absolutely worth the detour. We saw so much in the time we had with Ally, just amazing. I would highly recommend this tour and spending the day with Ally. Our day in Anstruther, St. Andrews, and Falkland was absolutely brilliant! Ally is knowledgeable, entertaining, and charismatic. We could not have asked for a more charming tour guide and views of beautiful Scotland! Thank you Ally for an awesome day! Ally was a wonderful guide. We were a party of many ages and interests and Ally was loved by us all. Our tour day happened to be very snowy and Ally figured out different things for us to see since some of the roads were closed by snow. We really enjoyed the "detours" at least as much as the planned sights. Ally is extremely knowledgeable about history, lore and current issues and events. In addition, he has a great sense of humor. We could not have been happier with our tour. We had a wonderful day with Ally. We really appreciate that he accommodated our 1 year old daughter and customized our tour for us. He is an experienced guide who is very knowledgeable about Scotland, Scottish history, and the specific places we visited. He also gave us great recommendations for the remainder of our stay in Inverness and Edinburgh. Glen Afric was the highlight of the trip — absolutely gorgeous! Ali met us at the pier in his Scottish attire and gave us a day full of adventure. Ally, our tour director, was awesome!!! He showed us everything and even helped me book our hotel rooms in a centrally located hotel! So many things we didn't need to know about Scotland were imparted to us along with many pertinent items of information. He was original and humorous. The entire trip, (8 people), was, in his words, like "herding cats" We enjoyed him very much and HIGHLY recommend using him for your upcoming trip! What fun to see our guide dressed in his full kilt attire waiting among all the other shirt & tie attired guides. Ally shared the history of Inverness, its castles and battlefields. The Urquhart castle ruins overlooking Loch Ness was amazing. We didn't see Nessie but had a great day touring. Only regret is a didn't get a picture with Ally in his kilt. Our group of eight travelers and family members decided to use Tours By Locals to take an excursion to the Isle of Skye in Scotland while we were staying in Carrbridge for a week. We were pleasantly surprised that our tour guide was extremely well versed in all things Scotland. He showed up ON TIME and had all of the proper things needed for our trip. He told us many, many things that we needed or didn't need to know about the area and Scotland! This kilt wearing comedian kept us well entertained. Ally B is a great. He is very knowledgeable about Edinburgh and Scotland. Took us to a great place for lunch. Ally B was a lot of fun. We enjoyed riding with him and learning more about Scotland. Ally was simply great. We had a lot of rain - and he was positive and kept us upbeat. He had a lot of interesting stories to tell and he was well versed in geology, history and the weather! His enthusiasm for his country and culture are deep and we really appreciated his insights into modern day Scotland and the UK. A good soul - we enjoyed very much our day together. 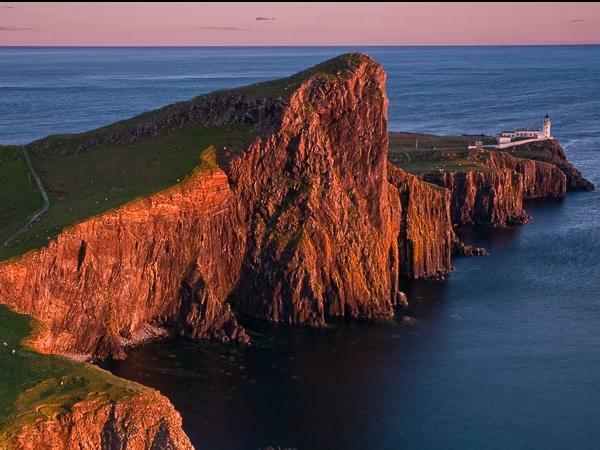 What a fantastic way to explore the Isle of Skye and the Highlands, with Ally as your guide! He was very punctual, kind & interested in making sure we thoroughly enjoyed ourselves, which we did indeed. We did a custom 3 day tour starting in Oban, JacobiteSteamTrain to Mallaig. From Mallaig Ally took us by Ferry to Skye, and we used Portree as o/n base there for 2nights explored it for 2 days.Our takeaway was just loving the rugged natural beauty of Scotland and its people. Highly recommend! Alexander is an outstanding and extremely knowledgeable tour guide. His knowledge of Scottish history is outstanding. Couple this with an exceptional ability to convey his information in a witty and interesting manner made his tour one of the best, if not the best that my wife and I have ever been a part of. Ally designed two custom tours for us and met us at two ports where our cruise ship docked. He is knowledgeable and a delightful tour guide. We have booked tours by locals in many countries and Ally was one of the best we have had. Highly recommend him Outlander tour was really special. He knows the hidden gems. Alex did a great job of showing our group around Loch Ness and the surrounding area. Very friendly and knowledgeable. We were so pleased with our Tour with Ally. He was an excellent guide and we saw a lot more of Scotland in one day than we ever could have with a shore excursion. We will definitely use Tour by Locals again. Great visit! Thanks for the attention to detail. We loved our tour! Thank you for spectacular service. The tour guide (Ally) is a wonderful guy with a very good idea of places on the tour to stop n stare. 5 stars for ally actually. The sandy beach on the scenic route from mallaig to fort william was a wonderful experience. The isle of skye is though quite a bit letdown and there are areas far better than it in mainland Scotland. The landscape and the scenic beauty is, I felt, highly overrated. It becomes a long car ride. Isle of skye (the place per day): 3 star. TOUR GUIDE RESPONSE: Hi Vivek, Thank you for your honest review. Its a shame you thought of it as a long car ride, but being a 9hr tour, we were going to be covering a big area. Funny thing was, I got the impression that you liked seeing Ben Nevis, the Great Glen, And all the Lochs that run through it, Loch Ness, Clunie Loch, Glen Sheil, Eilean Donan Castle, but with Skye I believe you were frustrated in only being able to see the South of the Island, but I'm delighted that you all liked the white sandy beach. Take care. Ally had a great personality. We loved his kilt and enthusiasm. I cannot say enough wonderful things about our tour with Ally. My mom and I spent two weeks in Scotland and Ireland and this was by far our favorite experience. Ally's vibrant personality, vast knowledge of Skye and its history, and humor made our excursion a memorable one. When I return to Scotland (hopefully soon), I will be booking another tour with Ally!